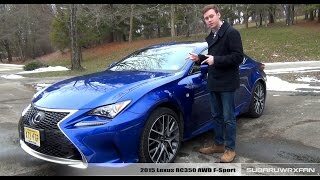 Taking the RC brand ahead, Lexus recently introduced the 200t F Sport, RC F and Lexus Rc 300 AWD 2016. The model has been engineering and crafted to deliver power, performance and luxury without compromising with any of them. Let us have a look at the detailed review of Lexus Rc 300 AWD 2016 to know more about its interior, exterior and performance figures. The interior of Lexus Rc 300 AWD 2016 has been crafted to serve both, the driver and the passenger. The newly integrated Lexus Enform Service Connect will allow you to remotely have a look at the few of the vital information while the other safety and infotainment features are the blend of luxury in class. The large door openings and spacious interior makes your ride a comfortable experience while the new clove tone with the essence of genuine shimamoku wood highlights is remarkable in its own way. A massive navigation screen and the instrument panel is housed with the navigation screen and audio system housed on either sides of a gorgeous clock. In all the interior of Lexus Rc 300 AWD 2016 is luxurious, spacious and comfortable enough to provide its buyers the best-in-class experience. The exterior of Lexus Rc 300 AWD 2016 carries the traditional legacy of the company. Starting with the front fascia you have triangular headlights, housed on either side of the massive spindle grille. The headlights feature an ‘L-shaped’ structure when at low beam. There is also an air intake integrated in the bumper to serve the purpose of delivering fresh air to the engine. The aggressive front fascia gets further complimented when you move at the rear end of the model. First thing that might grab your attentions is the set of air outlets alongside the gorgeously designed tail lights. Major blend of bold at the rear fascia comes through the dual exhaust tips housed beneath this entire set up. In all the exterior of Lexus Rc 300 AWD 2016 has been planted to spread lots and lots of aggression which can depict the power beneath its hood. Beneath the hood of Lexus RC 300 AWD 2016 is a 3.5 Liter V6 engine generating total output of 255 hp and peak torque of 320 nm mated to six-speed automatic transmission as standard. The robust power and well engineered body together is speculated to deliver appreciable performance figures, however the performance details of Lexus RC 300 AWD 2016 are not yet shared but we expect to have them in near future.